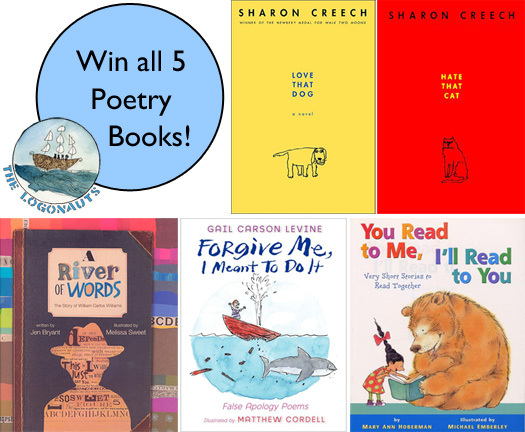 This 5-Book Poetry Package (a $40 value!) includes my favorite books for teaching poetry to kids, many of which I have written and shared about on the blog during the past year. Love that Dog and Hate that Cat by Sharon Creech. These two charming novels-in-verse are told through the writing notebook of reluctant poet Jack. I used Love that Dog as a read aloud during our poetry unit, read more in Teaching Poetry with Love that Dog. A River of Words: the story of William Carlos Williams. This Caldecott Honor book from the talented duo of Jen Bryant and Melissa Sweet is a biography of the American poet and doctor William Carlos Williams. His plain, yet descriptive style, is a great encouragement for aspiring poets. Forgive Me, I Meant to Do It: false apology poems by Gail Carson Levine and illustrated by Matthew Cordell. Inspired by a William Carlos Williams poem, this hilarious and irreverent poetry collection can turn anyone into a poet. Read more, including student poems, in Poetry Friday Roundup is Here! You Read to Me, I'll Read to You: very short stories to read together by Mary Ann Hoberman and illustrated by Michael Emberley. These partner poetry books are among the most-read and most-requested in my classroom. Read more in the Power of Poetry Friday in the Classroom. Thank you for all that you do to inspire me! Love the "You Read to Me, I'll Read to You" Thanks for sharing and for offering the giveaway. I entered!! what a great giveaway...I haven't read any of those, but know AJ would love to read with me. My all time fave poetry books are the Nat Geo ones ... the animal one that's already been released and the landscape one that is coming out this fall. They get great poets and then match their words with awesome Nat Geo photography! But of course the ones on this giveaway are by equally talented authors and illustrators! Happy First Blog Birthday, Logonauts. I wish you many more of them and thank you for all the informative posts you have given us over the past year. And what a great giveaway to celebrate your Blog Birthday. Happy Blog Birthday! This is such a fun giveaway. I haven't had a chance to read any of these books, but am anxious to check out Forgive Me, I Meant To Do It. I'm sure my grandson will get a kick out of it. What a great collection of books. Thanks for such a great giveaway. I hopped over frm the Kid Lit blog hop. What a nice idea for a giveaway! I have to read more of the apology books.